SIDMOUTH RIDING is CONVENIENT but has easy access to OFF-ROAD RIDING. We have plenty of GRAZING and TURNOUT as well as MANEGE available to clients. INCLUSIVE terms for D.I.Y LIVERY we give clients: hay, straw, stabling and utilities. 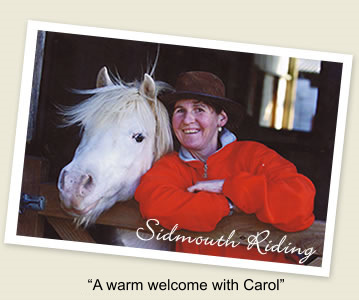 SIDMOUTH RIDING is an active and FRIENDLY YARD with a range of ages and abilities. STABLING is provided to suit ALL SIZES of HORSES & PONIES at SIDMOUTH RIDING. We have been ESTABLISHED FOR 20 YEARS and keep all our own equines here. All information is correct at the time of compilation but may be changed and does not constitute any offer.